Welcome to Day 12 of the 5 Minute Promo. We are more than one third of the way through the challenge and by now you should be finding most of the tasks pretty easy – because you did the setting up of accounts and platforms in the first few days and now it’s mostly about keeping it all ticking along with new content and an increasing audience. Today’s task is another easy one, similar to yesterdays. Are you ready? 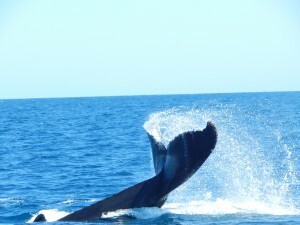 This whale tail is completely unrelated to all of my books, but it makes me smile. Head to Twitter and share a link to something completely unrelated to your book. If you’re a football fan, tweet about your football team. If you’re a gardener, tweet about your roses. If you have a dog, tweet a link to a dog video. You get the idea? Something that is not about your book or even about stuff that happens in your book. How is this promoting your book? It isn’t, not directly. But, indirectly, it helps. You see, people on Twitter (and Facebook/Instagram/Pinterest etc) don’t like constantly being advertised at. If you met a friend in the street and started trying to sell your book, they would probably get turned off. But if you exchanged genuine conversation with them and then they heard you’d written a book, they might be interested in buying it. The same goes online. People want to hear from you about all kinds of stuff and then, as they get to know you, they are more likely to respond to the plugs you give your book. So, off you go. In the next five minutes find something to share and Tweet it. If that doesn’t use your whole five minutes, spend the rest of the time seeing what other people are tweeting about and try retweeting or replying. Enjoy. And see you tomorrow. Set your timer and get ready for today’s 5 minute task, because I’m going to jump straight into it. Yesterday I promised the last day of getting you to sign up for social media platforms, so today I want to suggest you do something quick and easy – and it’s about signing something rather than signing up. If you are like me you probably write and send dozens of emails every week. Some are writing related and others aren’t. But every one of those emails can bear an advertisement for your book or books. If you email your child’s teacher about her homework -and there’s a signature line? Your teacher learns about your book. If you forward a referral to your doctor? Your doctor learns about your book. If you send a query to a new ediotr? The editor learns about your previous book AND sees that you are willing to promote your work. It’s win win. You can see mine has pictures, my name plus the URL of my website. You could use text instead of pictures, and you could add more links (for example to online bookstores). There’s lots of possibilities. 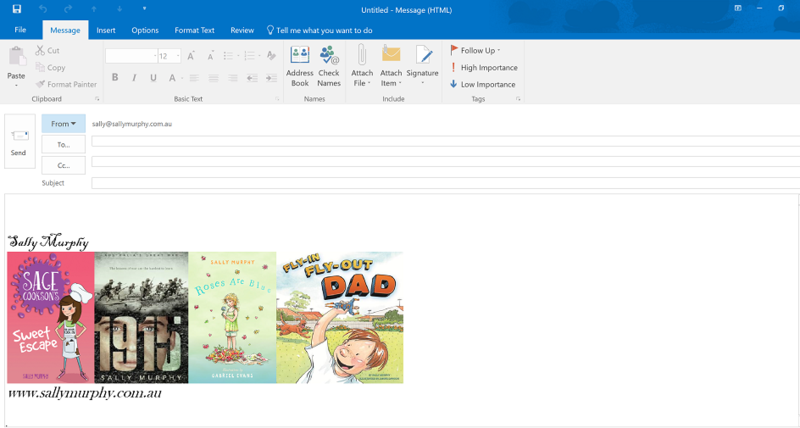 There’s a quick guide to creating a signature for Outlook: here. If you use a different program, use a search engine and you will find a similar guide. So, what are you waiting for? Your five minutes starts now. As awlays, feel free to leave me a note, or tweet me and let me know how you go. Set up a Pinterest account. Yes, you’ve got it, I want you to join another social media platform. This is the last one, I promise (for now!). 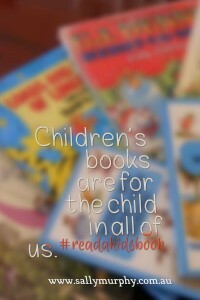 So, after you’ve read my few words, head over to Pinterest, sign up and you are ready to Pin. There’s simple instructions on how to get started here and instructions on how to set up a board and start pinning here. You might extend your five minutes and set up a board about your book. 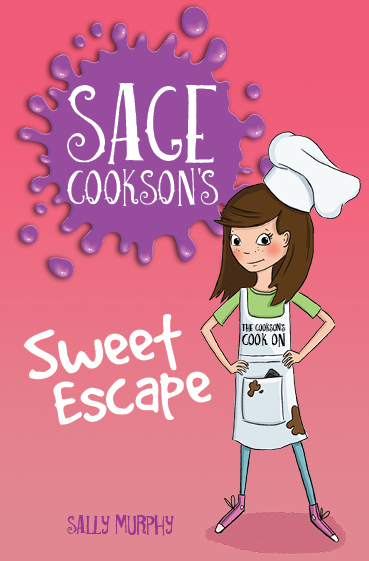 Here’s one I’ve set up for Sage Cookson’s Sweet Escape here. Already on Pinterest? Your five minute task is to make sure your profile and account is up to date and, once that’s done, use the rest of your time to pin two new pictures to one of your exitsing boards. Easy peasy. 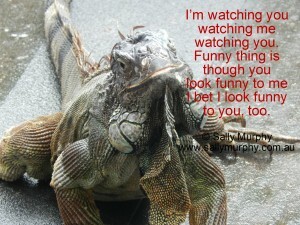 Feel free to follow me, Sally Murphy Author, while you are there. A quote with photo – and, of course, my web address so people know to visit me. A poem I wrote, added to a photo I took and again with my URL and twitter handle. Welcome to Day 4! If you are following along at home, by now you have written a blog post, opened or updated your Twitter account and opened or updated your Instagram account. You’ll have noticed that so far all of the tasks I’m sharing are to online – because using social media and the internet is such a quick, free way of promotion. And today, I continue that trend. Create a Facebook Author Page.Assuming you are already a member of Facebook, it will take only a couple of minutes to start a page for you, the author. There’s a quick guide to starting a Page here. I posted this pic on my Facebook page the day my author copies arrived. An author page is different than your personal profile where you can post about your kids, your walks on the beach, or your dog. Instead, your Facebook page is about your brand as an author. Having said that, not every post will be about selling your book. As a starting point, use your author photo (if you haven’t got one, it’s time to take one), a header picture which might be something from your website and add a cover photo of your book. Once you’ve posted something, invite your friends to like it. Already have a Facebook page? Of course you do! Then your five minute task is to make sure your photo is up to date, and post something new. Then, because your five minutes won’t be up yet, invite the friends who haven’t yet liked your page to like it now. Want to see what a Facebook author page looks like? Feel free to look at mine and follow it. I’ll do my best to entertain you with regular fresh content. 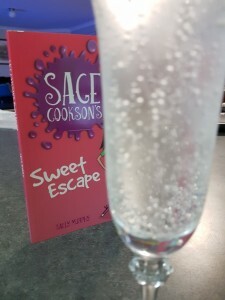 If you a regular follower of this blog, you might know that today is release day for my new book: Sage Cookson’s Sweet Escape. If you are not a regular follower, firstly, welcome and secondly, you know that it’s the release date etc. And, by the way, isn’t the front cover amazing? Anyway, back to the purpose of this post: 5 Minute Promo. As an author, I’ve long been aware just how important it is to promote my own books. Sure, my wonderful publishers do their bit, but they have lots of books by lots of authors to promote. Wheras me, I only have my own books to focus on, and generally one at a time. But I’m busy – sometimes frantically so – writing new books, working my way through a PhD project, visiting schools, festivals and conferences, not to mention running a household. So, my promotion can’t take hours and hours every day. Ont op of that, the most important time for me to be promoting my new book is in the first month of its release. Bookshops get new stock in every month. That means my book is only new for a month. If I want it to sell well, it’s important that I promote heavily during that month, in the hopes that it will sell well the booksellers will continue to stock it, and stock my subsequent books. So, putting those two things together: the need for quick promotion ideas, and the need to do them especially in that first month, I sat down and brainstormed 31 things (one for each day of the month) that could be done in five minutes or less. And, because I like sharing, I’m going to share those 31 things, one each day. So, if you have a book to promote, or have one coming out soon, you can play along at home. Every day I will post a new five minute tip, and give examples. If you join in, let me know how you are going, either by commenting here, or on twitter (feel free to follow me). So, enough about what I’m going to do. Let’s get on with it. Here is the first idea. Write a blog post announcing your new book . Make sure you include the cover image, and a link to where the book can bought. Give some details about the book. (If you don’t yet have a blog, then use the five minutes to head over to a free blog platform such as wordpress or blogger and set up a simple blog). Here’s my post (or you can just scroll down) which I combined with a post about Poetry Friday, because that’s my usual Friday post, and because it will spread the word to my poetry network. Playing along? Set your timer for five minutes and head off and write and post that blogpost, then leave a comment below with a link and I will check it out.